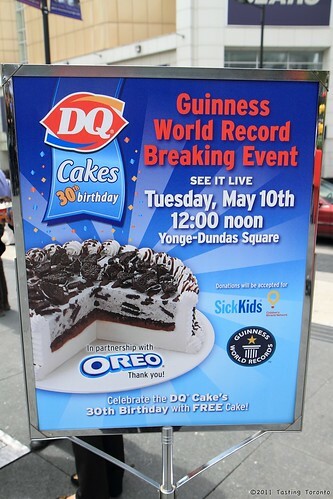 On May 10, 2011 at Yonge-Dundas Square, Toronto entered the record books as host to the world's largest ice cream cake. Guinness World Records was on hand to officially weigh it in at 10,130.35 kilograms. That's over 10 tons or over 22,000 pounds. A forklift and 22 workers from Dairy Queen assembled the ginormous treat with a vanilla ice cream core, 90 kilos of sponge cake, and 136 kilos of icing and crushed Oreos. The record was previously held by an 8,000 kilogram cake from Beijing, 5 years ago. Dairy Queen hosted the event to celebrate the 30th anniversary of its ice cream cakes. Ooh I am so jealous! I was like two blocks away and didn't even realise it was on!